No, I’m not being lazy or trying to sneek in a duplicate post. Actually, I was told by a close adviser and the photo-contributor of this blog that what I wrote after seeing Senator Obama’s face on two kick drums was a bit skimpy and could’ve been more meaty. Please allow me to redeem myself. Okay, so what. 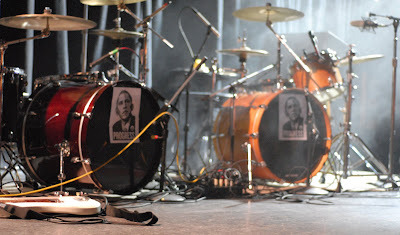 I saw two Barack Obama flyers on a kick drum at a rock concert in Chicago. Should it mean anything? Yes, it does. It actually means a lot. Mainly because I was in an environment where entertainment is the community drug for the moment and having the Obama flyers glaring back at me forced me to think about who I am going to vote for, a decision that is both unsettling and immensely frustrating, two emotions I didn’t want or expect to experience during the show. The flyers forced me, in a moment of elation and escape, to face a question that I would rather just avoid or not think about, at least until, the concert is over. Don’t bother me with political decision during a concert, right? Well, this wasn’t the case. I didn’t get a chance to ask Office why they chose to propel a double assault of their choice candidate but they were successful in getting me to think beyond the rock and roll my mind into a more mid-song-poli-sci-daydream moment as they rained down shimmering pop melodies. And the funny thing is, not once did they even say Obama’s name, not so much as a fist in the air or even a sly or sarcastic comment about how they hate the current establishment. In hindsight, what this show got me thinking about was the upcoming forty year anniversary of the Chicago 1968 Democratic convention when the Detroit rock band MC5 played in protest of the war and other issues. I wasn’t even a thought of a though of a thought yet, heck my parents hadn’t even met yet, I don’t think. But I’ve heard the recording, seen the video and read about the concert and when I think of what it might have been like to be there in 1968, the closest I can get at this point is to face some of the unrest and anger of having to think politics while Office and Daniel Johnston played and know that I will have to make a choice for candidate very soon. However hard that may be. So as I was stared down by Senator Obama’s eyes, calling me to think beyond being entertained, I drew closer to understanding what turns most people off when an artist stops the show to get political. There’s usually more uncomfortable grumbles than cheers. Yes, there’s a few claps, but mostly, there’s a growing unrest building in the crowd for the artist to get back to what he is suppose to do; Play music, not rant his subjective views of poli-sci to us when we’ve paid our hard earned money to give him the stage to sing and play. And when that trust is broken and an unwanted political rant comes spewing from his mouth, the show turns blah and what was once a glorious moment of escape has now become a terrible moment of rhetorical slavery. But I really didn’t mind the flyers. They were perfectly placed both visually and rhythmically and I thought they were a unique and funny way to connect the primaries with the primary reason why the Metro was near capacity, to enjoy a show. All without taking away from either. While live rock music and politics might seem at times like two distant relatives, they’re actually more closely related than I realized, wanted or unwanted. Have you experienced an unwanted political rant from an artist during a show? Have you been swayed to support (or trash) an artist after he went political during a show? Let me know. Let’s discuss.